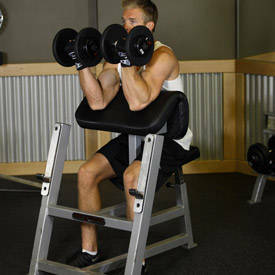 Grab a dumbbell with each arm and place the upper arms on top of the preacher bench or the incline bench. The dumbbell should be held at shoulder length. This will be your starting position. As you breathe in, slowly lower the dumbbells until your upper arm is extended and the biceps is fully stretched. As you exhale, use the biceps to curl the weights up until your biceps is fully contracted and the dumbbells are at shoulder height. Squeeze the biceps hard for a second at the contracted position and repeat for the recommended amount of repetitions. Variations: You can perform this exercise also using a low pulley instead of a dumbbell. In this case you will need to position the bench in front of the pulley. You can also use a barbell or an e-z bar.